The Moulin de St-Laurent Restaurant has been a family business for more than twenty five years. 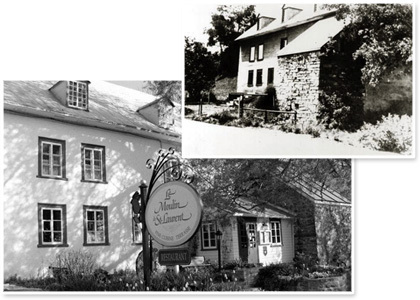 In December 1986, Yvon Premont , his sister Elise Premont and her husband, Jean-Victor Lachance purchased this historic building. The first objective is and always has been to continue tradition and hospitality, good wine, good cheer and good music; all within an enchanting and romantic setting. A few years later the couple’s two daughters, Anne and Julie joined the team. Lodging was started in 1996. Luxury, riverfront chalets offer a unique concept; dining in the restaurant, accommodation and breakfast in the chalets facing the spectacular waves of the St-Lawrence. Nothing could be better than a short getaway or long stay.